We had an unforgettable vacation in this beautiful Balkan country. 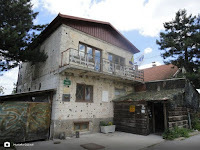 I will share with you the notes about our trip starting in Sarajevo. Basing our accommodation in Sarajevo during the whole trip, was very helpful in discovering the country from its center. Just like the times before the war, Bosniaks, Croats and Serbs live together now. 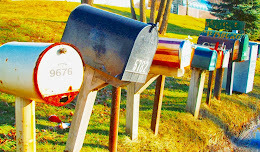 The cultures have commingled and the effects of the war have subsided. We can say that the war has been effective with regards to strengthening the identity of the Bosnian Muslims. Plus among Bosnians there is a strong tendency to become European. 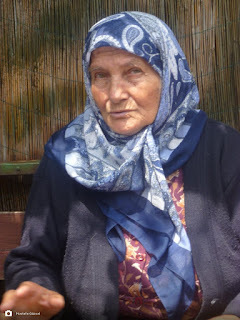 There is an excessive amount of affection for Turkish people in Bosnia Herzegovina. At most of the shops, mosques and on the streets you see Turkish flags, and in central spots branches of Ziraat Bank can be found. You can easily see the influence of Turkey on Bosnia. 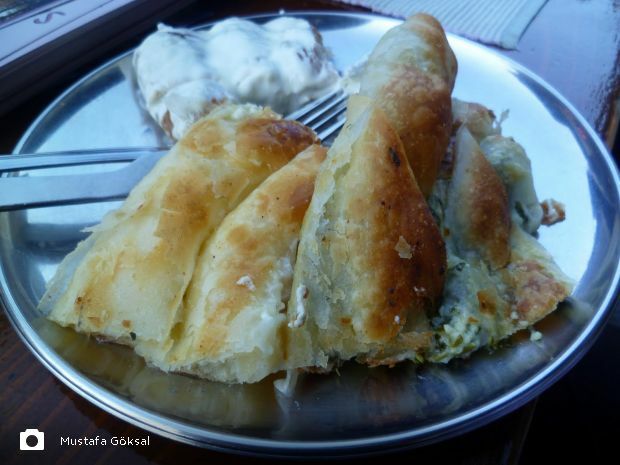 The cuisine of Bosnia is very nice: The Bosnian Burek, Cevapi and lamb chawarma are fabulous, they are very cheap. You can't leave Bosnia without drinking Bosnian coffee. The memory of the coffee being served in its special pot will stay with you forever. If you're considering what to buy from Bosnia as a souvenir, I recommend a coffee pot set. 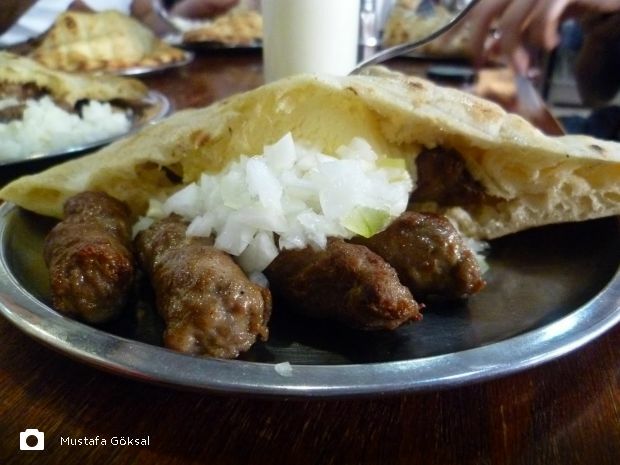 Your first stop in Sarajevo should be Başçarşı. In this historical Ottoman market you can have supper, shop and visit important buildings like Gazi Husrev Beg Complex. Also don't skip the Morica Han where most of the Turkish people hang out in Sarajevo. 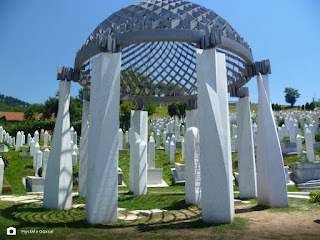 The city has a war cemetery where martyrs and the legendary leader Aliya Izzetbegoviç are buried. Kovaçi War Cemetery is more than a graveyard, it's an amazing garden where you can hang out. One of the places that you should see is The Tunnel of Hope, aka the Life Saving Tunnel that helped 300 thousand people to survive during the Bosnian War for 30 months. The one and half meter high tunnel was dug by volunteers to connect the airport territory, where there was no battle, with the region which was described as Free Bosnia during the siege, and it helped to transport casualties and supplies like medicine and food. This tunnel passes through the house of a war heroine, an old lady who earns her living by selling souvenirs to visitors. Among the visitors are world famous actors and actresses. Right now only a small part of the tunnel is open to visitors. At the end of the tunnel you can watch a short documentary composed of images from the Bosnian war. The house through which the tunnel passes still embodies all the traces of the war. In Sarajevo there is also the Latin Bridge, where the heir to the Austro-Hungarian throne Franz Ferdinand was shot and killed by a Serbian nationalist named Princip on June 28, 1914, the event that eventually led to the outbreak of the First World War. 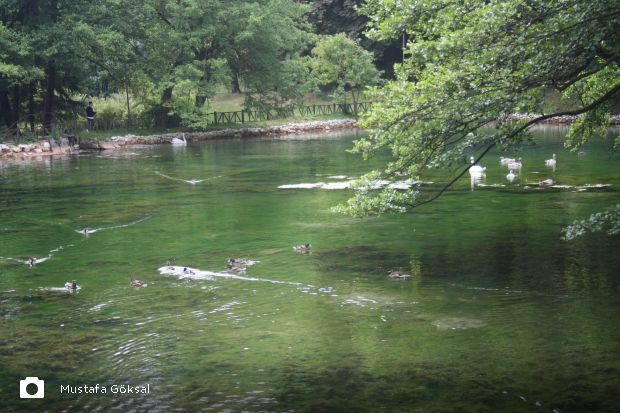 If you're curious about source of the river which passes through the city I recommend visiting Vrelo Bosna Park. Inside the park you'll find ponds, swans, and ducks; it's a very peaceful and relaxing place that is sure to leave you in a good mood with its bubble of fresh air within the city. You can reach the park by cable car or bus, but I advise you to go by the cable cars that were also used during the war. That way you can get a feel how it must have been for the Bosnians who were shot at by snipers in the cable cars. During our trip we dropped by the Yunus Emre Cultural Center, which belongs to the Yunus Emre Foundation, where Turkish lessons are given. There are organizations co-working with the charity foundations in Turkey; Istanbul Cultural Center is one of them. If anyone asks you about the Bosnian War, the first two things that come to mind are Srebrenitsa and Mostar. 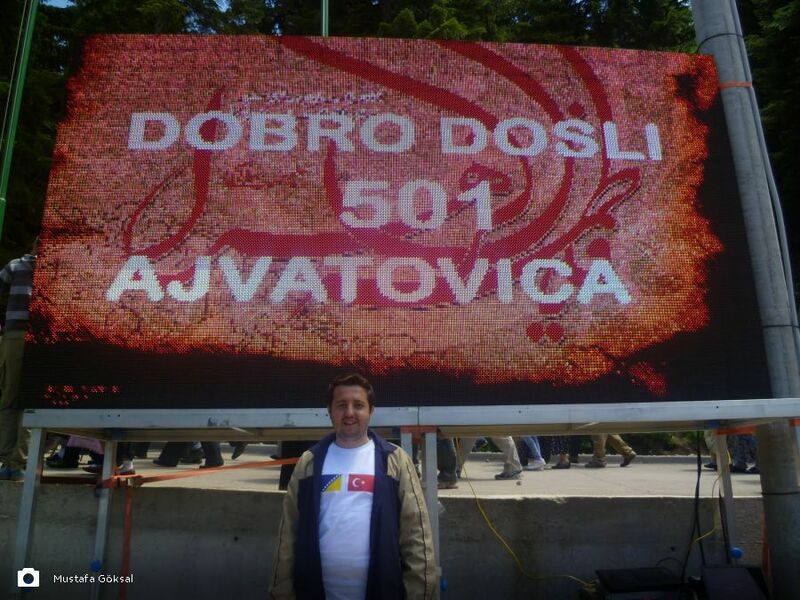 Mostar witnessed the brutality of the war very deeply and it has turned into a symbol of the Bosnian War. This is a place where the effects of the war can still be keenly felt. Mostar is a two hour journey from Sarajevo. 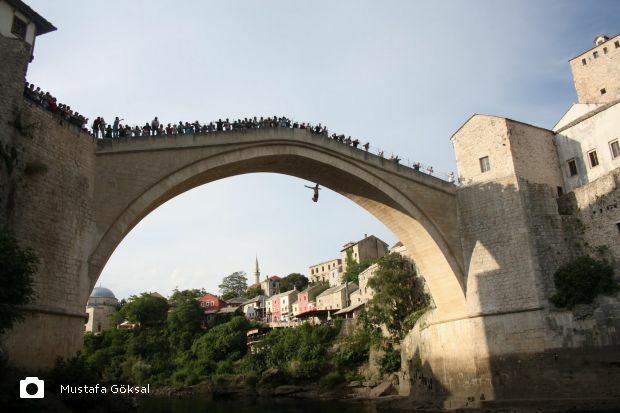 There is also a sister bridge in the city called “Crooked Bridge.” To leap from the bridge into the Neretva River is popular show of manliness among men from Mostar. There are also people who jump from the bridge for a fee. When we were there, we were lucky to see someone jump. Sarı Saltuk Blagaj Tekke, from the Ottomans, is located in Blagaj, which is within the borders of Mostar. The spot where the tekke is situated is quite different. I have included some photos of it, so that you can get what I mean, since words are not enough to describe it. The nature is amazing. The coldness of the spring is unbelievable, you can't keep your feet in it for more than a second. When they set up narrow bridges for pedestrians, restaurants were also opened in the area. 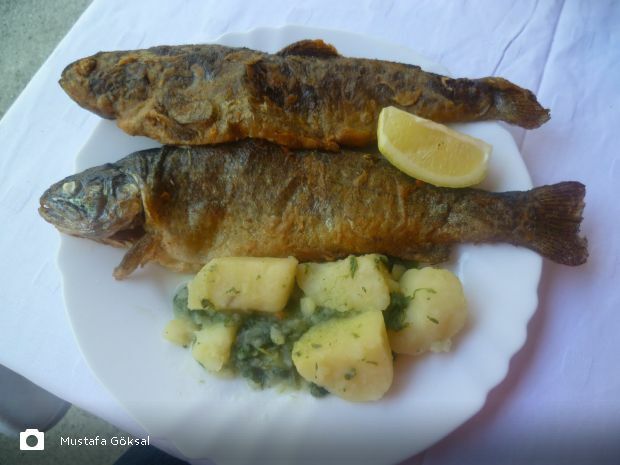 You can eat very delicious fish there. There are also portable shops selling souvenirs. Travnik, which is one and a half hour from Sarajevo, is one of the cities with the largest Muslim populations in Bosnia and Herzegovina. It's also where a lot of viziers of the Ottoman Empire had their origins. Also here people have a special affection for Turkish people. 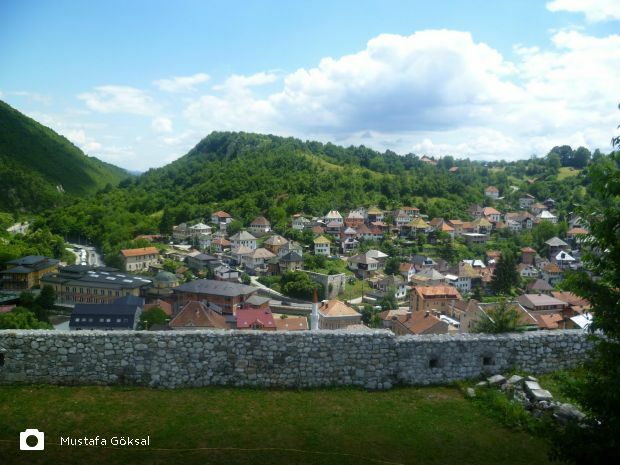 A few of the places to see in the wonder of nature Travnik are Travnik Castle and Suleimanie Mosque, which is a representation of Ottoman architecture. Ibrahim Pasha Madrasah is also located in this town. The almost 5 hundred year old Madrasah continues its services as an institute of education. During our trip we had the opportunity to join a very important event: Ajvaz Dedo Celebrations. One of the most important religious and cultural events in the Balkans, Ajvaz Dedo Celebrations, are organized in the memory of Ajvaz Dedo who was a dervish from Khorasan. This tradition started when after 40 days of praying to Allah to solve the water problem of the Prusac, Ajvaz Dedo’s prayers were answered. Apart from during the Yugoslavian era, this tradition has been going on for 500 years. To reach the highland where the celebrations take place you have to walk on the asphalt road first, then on the soil and then through the woods for 8 kilometers, but the scenery you'll find will make all your efforts worth it. What gave us a hard time was the paths done by TİKA (Turkish Cooperation and Coordination Agency). The stones that were put to make the walk easier have had the opposite effect and hurt the feet. I hope this problem will be solved in time. 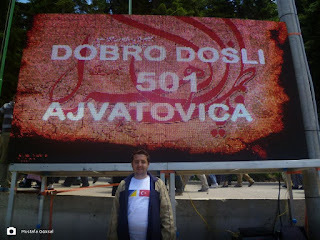 When we were there, it was the 501st anniversary of the celebrations. The president of Bosnia and Herzegovina, Bakir Izzetbegoviç, also joined the celebrations. 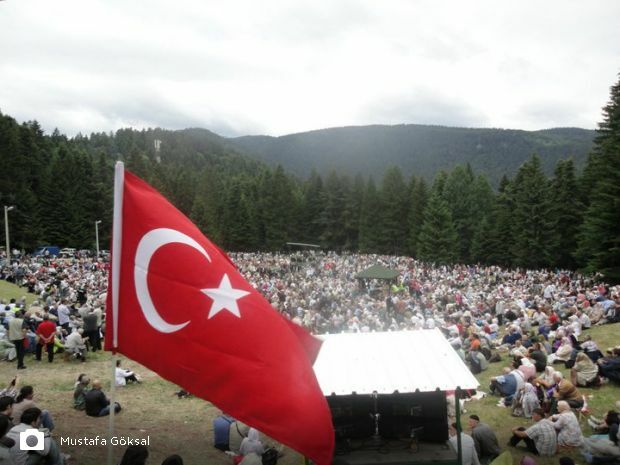 The sister town of Sarajevo, Bursa, took its place in the celebrations via a delegation of its municipality officials. During the celebrations, the Koran was read, hymns were sung and prayers were said. With the performing of the noon prayer by thousands of people, the celebrations came to an end. After the prayer, just like the cavalcades of the Ottoman Empire, the cavalries from each town passed in review. This celebration, which was attended by 10 thousand people, was certainly one of the unforgettable memories of our trip. 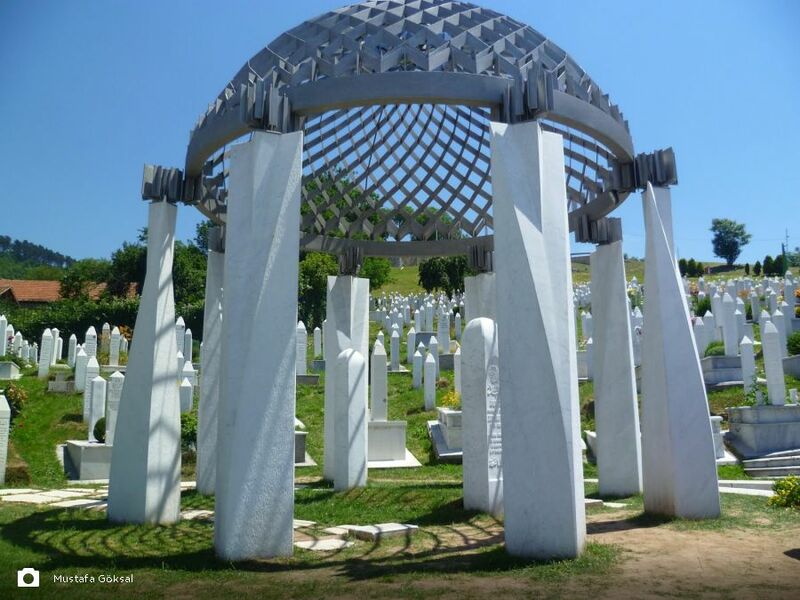 If you plan to visit Bosnia and Herzegovina, try to schedule your trip to coincide with the Ajvaz Dedo Celebrations for the contribution of some colorful scenery to your trip. We spent our days to the full extent in Bosnia and Herzegovina, and we finalized our trip in a really intense mood. A very devoted Istanbul lover, I, for the first time, in my life, wanted to be in a different city, other than Istanbul, in Sarajevo. I hope this country which made me feel like home will have a brighter future. İlk olarak otel rezervasyonu kapıda sormuyorlar fakat o pasaport polisinin ruh haline kalmış bir durum, sorabilir. Problem değil arkadaşınızın adresini ve iletişim bilgisini verebilirsiniz. Şayet şüphelenirse zaten telefon edip sorabilir. İkincisi ise, her uçuşunuzun biletlerini gidiş dönüş almanız o ülkeye girerken size kolaylık sağlar. Şayet hem dönüş biletiniz olmaz hemde kalacak bir otel rezervasyonunuz olmazsa pasaport polisi bu durumu şüpheli olarak algılayıp sizi ülkeye almayabilir.